Free download Chicken Invaders 4 Ultimate Omelette game for PC. It is another game in Chicken Invaders game series. Chicken Invaders Ultimate Omelette is forth game in the series of this game and a sequel of Chicken Invaders 3 game. You can enjoy the free demo version of this game. 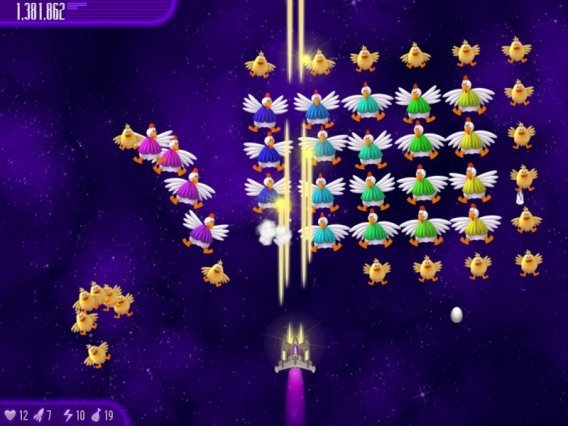 Chicken Invaders 4 Ultimate Omelette is very easy to download and install it. You can download the game from the download link given below. It will take few minutes that depends on your internet speed. After downloading, run the game setup and install it usually. After installation, you are ready to play this game on your PC free. The game play method of Chicken Invaders 4 Ultimate Omelette is very easy. You can control the jet using your mouse or keyboard. The settings from keyboard game play can be changed from the options menu. Chicken Invaders 4 Ultimate Omelette can be played with two players. If you are with your friend, you can invite him to play this game. If there are two players for Chicken Invaders 4 game, it is recommended to play as player 1 with mouse while player 2 using your keyboard. When the game will start, the jet will start to destroy the chickens. There will be various chickens those will attack in group. You have to kill all using your jet’s fire. You must have to escape your jet to be encountered with chickens, eggs or omelette. If any of them will touch your jet, it will destroy.